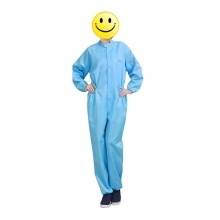 *Anti-Static suits,made of special polyester filament and high performance permanent conductive fiber by special weaving process,it has excellent and lasting anti-static dust-proof performance and can effectively release human body electrostatic charge. *Widely used for electronic,pharmaceutical,food processing,spray painting,biotechnology,new energy and other working environment. *Comfortable for wearing,round collar design can effectively control the human dust accumulation.An effective barrier to the body static. *Can be washable and Can be used repeatedly,very convenient and practical. *Perfect details:Fine processing paste,high elasticity cuff,elastic waist,metal zipper head,all that are for you comfortable wearing and long time use.